Address: 8215 S. Old Oregon Inlet Rd. 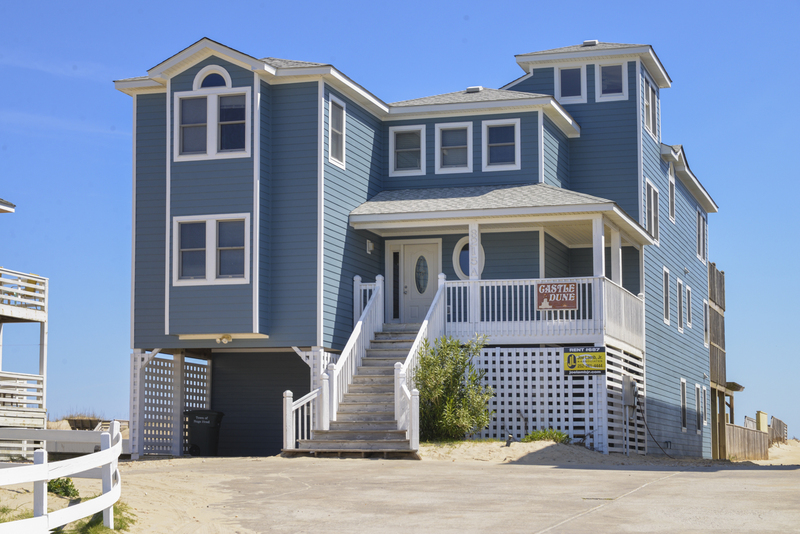 Enjoy the Royal Life, you'll be treated like a King, while vacationing at "Castle Dune" located on the Oceanfront in peaceful South Nags Head. This expansive 10 Bedroom estate provides Panoramic Ocean Views & a long list of features that are sure to make your stay on the Outer Banks a memorable experience. Spend your days sunning on the Beach or lounging by the Large 29 x 13 Private Swimming Pool or soaking in the Hot Tub. This home is located within walking distance of Jennette’s Pier. Offering something for everyone, this Vacation Castle is beautifully decorated & has a Game Room w/8 Foot Pool Table, Kitchenette w/Full Size Refrigerator, Dishwasher, & TV, VCR, Stereo. Ground Level: Parking for 8 Cars, Entry to Home, Large Game Room w/Pool Table, TV, VCR, Stereo w/CD, Kitchenette w/Wet Bar, Dishwasher, & Full Size Refrigerator, Half Bath, Laundry Room, 3 Bedrooms (Master Suite w/Queen, TV & Full Bath; 1 w/Bunk Set, Single, TV/VCR, & 1 w/Duo Bunk & CATV), Shared Full Bath, Access to Private Swimming Pool , Large Pool Deck, Pool Side Pergola w/Table & 4 Chairs, Gas Grill, Enclosed Outside Shower, & Walkway to Beach w/Dune Top Deck. Mid Level: 6 Bedrooms (Oceanfront w/King & TV, 1 w/King, Shared Full Bath; Oceanfront w/King & TV, & VCR, 1 w/Duo Bunk, TV, & VCR, Shared Full Bath; & 2 w/Queens, & Shared Full Bath), Laundry Area, Covered Deck w/Hot Tub Overlooking Pool & Beautiful Ocean Views. Top Level: Expansive Great Room w/Large Living/Dining/Kitchen Area, Fantastic Ocean Views, 46 Inch Flat Screen HDTV, VCR, DVD, Stereo w/CD, Surround Sound, Gas Fireplace, 2 Dining Tables, 2 Dishwashers, Wet Bar w/Ice Maker, Half Bath, Grand Master Suite w/King, TV, & Full Bath w/Jacuzzi, & Large Sun Deck. Features Include: C/AC & Heat, 2 Washer/Dryers, 3 Dishwashers, 2 Microwaves, Phone, 10 TVs, VCRs, DVDs, 2 Stereos, Videos, Books, & Baby Equipment (High Chair, Pac-n-Play, Baby Gates, & Booster Seat). No Pets. This is a Non-Smoking Unit. Great location and had a really good time. Great customer service. House was very well stocked. We had no issues at all with needing anything! Location was perfect. Seventh year in a row, and since the new owners stepped in a couple of years ago things have been excellent all around. Thank you for giving our family a wonderful annual vacation home. Cleanliness and general condition were excellent . Great home, with very spacious accommodations. Pictures online are very accurate, unlike some the other properties that I've visited. Gorgeous ocean view and a home that you will definitely fall in love with. Once you have stayed here, you will definitely want to go back! 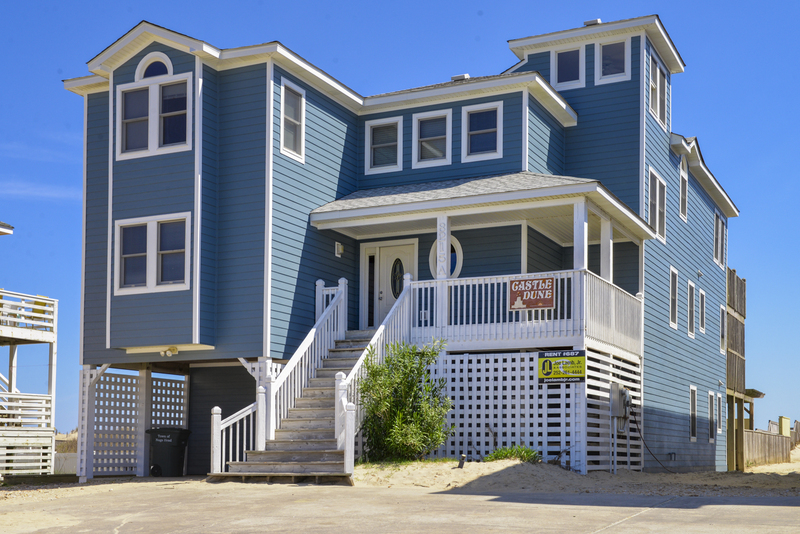 The location right on the beach is ideal, the home itself well-cared-for and well-equipped, and Nags Head itself is a great location. Enjoy Castle Dune! We enjoyed staying at Castle Dune. The house is beautiful. There was plenty of room for everyone and we enjoyed all of the views and amenities that Castle Dune had to offer. For a vacation rental, there were no major issues that would prevent us from renting this house again. The bedrooms were quiet, distance to the beach was short, pool area was large. We loved the beach house! The multi colored chairs on the top deck were great! Sooo cozy and looked great when looking at the house from the beach!